There’s no doubt that Hearthstone is currently the name on everyone’s lips; whether they’re esports rookies or hardened betting experts, this wholly-mesmerising, high-quality digital-trading card game by Activision Blizzard has taken the world by storm! The game is set in a fantasy realm populated by a whole host of weird and wonderful creatures, with heroic players embarking on a journey filled with witchcraft, spells and enchanting twists and turns. All evidence points to Hearthstone taking its proud place alongside some of the world’s leading games in the betting business. The popularity of the game is already such that several major betting sites have already added Hearthstone-game-betting to their portfolio. This article will explore all the reasons why Hearthstone is set to become 2018’s biggest new game. We’ll list what we believe are the best and most trusted Hearthstone betting sites online today. We’ll give you betting advice; tell you all you need to know about bonus offers, payment options, including real money and skins, and online security. Games of Hearthstone’s calibre require an equally streamlined betting site to pay them homage, and we only select what we think are the very best to recommend to interested punters. Functionality is given substantial weight; we also look at the site’s odds, special features and customer service, as well as the range of payment options, bonuses, prizes and promotions. Accessibility, for example, can do much to sway a potential bettor’s choice when it comes to selecting a Hearthstone betting website; most punters will want to keep themselves updated or even place wagers while on the go. Those looking for competitive odds might go for Pinnacle, while the less patient might prefer the promptness of Betspawn’s deposits and withdrawals. Hearthstone’s rapid climb to fame since its introduction in 2014 has rendered us firm fans. Our responsibility here at Esportsbets24.com is to inform Hearthstone enthusiasts of promising new Hearthstone betting sites. Arcanebet, for instance, has recently added the game to its e-sports portfolio and offers an adequate selection of betting markets, covering several Hearthstone matches; esportsbetting.com has also followed suit, though its betting markets are relatively limited. Learning to play Hearthstone is not particularly challenging; a look at the game’s official site is more than enough to get you started, as it provides detailed instructions. Hearthstone betting takes place between individuals and not teams, so a player needs to study his opponent before placing an informed bet. Most reviewers will recommend starting out with a fixed-staking method. This is a low-set wager designed to exercise control over your bankroll until you develop a feel for the game. Another useful tip is to look for favourable odds. This way, seasoned bettors can then use mathematical strategies such as the Kelly Criterion to bet when they believe the odds to be in their favour. You may also choose to watch other players practising on live streams, better to develop your own strategy. Check out https://youtu.be/kjDQ0rRwBAQ for more useful tips. Hearthstone is a rewarding game in more ways than one; not only does it provide players with thoroughly absorbing gameplay, but there’s always the chance to win some money. 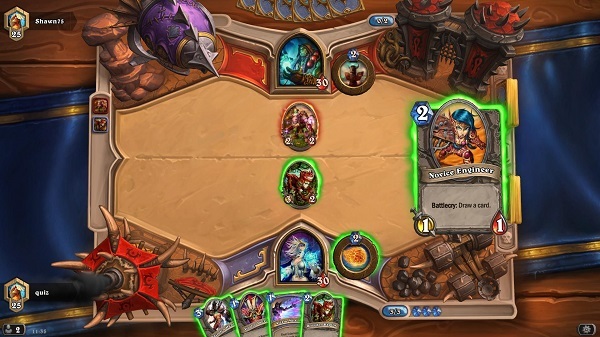 This game’s odds differ from several others because Hearthstone relies more heavily on strategy than luck, and players find they have to learn the playing style of their opponents in order to place informed bets. A useful rule of thumb when placing bets on individual players is to back the current favourite. This way, you have a higher chance of winning, though it’s certainly not unheard of for the underdog of the pair to come through in a surprising twist. Most bookmakers offer real-money bets on Hearthstone, which work in exactly the same manner as other e-sports, with a small number allowing virtual-currency bets as well. Special odds, which focus on more specific match details. Live betting is not available for now. Are there any free bets available? Discerning bettors are constantly on the lookout for free bets and deposit bonuses, which are often pretty useful for starting off and building up a substantial bankroll. Most bookmakers offer a deposit bonus upon registering. This can, however, vary greatly from one site to another, so it’s always wise to shop around. Esportsbetting.com, for example, offers a particularly attractive welcome package of 2 x 13.37 risk-free bets. Other betting sites will reward bettors with free bets or bet credits for a fixed amount. We’ve already said that Hearthstone is a digital card-trading game, but summing it up in such a simple phrase is simply not enough. The game revolves around the same fantasy world as World of Warcraft and is inhabited by many of the same creatures, which feature on the four main types of card – hero, minion, spell and weapon. Each card carries a specific feature, whether it be to reduce its opponent’s health, cause damage or summon minions. Players, having chosen to be represented by one of nine epic heroes at the beginning of the game, trade cards with either a real or computer-generated opponent and aim to bring that opponent’s health down to zero from the starting score of 30. Whoever does so first, wins. Cards can also be collected by undergoing missions, levelling expansions, and so on. There are currently well over 1000 cards for collection, with some special cards only awarded by completing specific actions during gameplay. After completing the Basic Set, players will have to spend gold or real money in order to start collecting the other sets. We’ve underlined the basic objective of the game above; but there’s much, much more than simple game-based play, even without mentioning the game’s smooth interface, gorgeously detailed graphics and ingenious twists. The game is a learning experience in itself; as players increase their confidence, they unlock access to special cards and are given the opportunity to compete in matches or engage in Tavern Brawls for extra rewards. Though most gamblers tend to stick with their favourite bookmaker, it doesn’t do any harm to browse through the competition once in a while. Keep an eye out, in particular, for new betting sites who’ve recently added Hearthstone; they’ll probably be offering attractive bonus promotions and free bets in order to attract new punters. Stick around if you’re hoping to win big. Hearthstone has gone global with highly anticipated, world-famous championships, and, with a whopping $1,000,000 prize pool, that’s hardly surprising! Hearthstone players are given the chance to choose a member to represent their country, then place bets on the outcome of the match as it is followed closely by their chosen Hearthstone betting website. Apart from the long-awaited yearly tournament, Hearthstone also holds regular Fireside Gatherings, as well as regular, smaller play-offs and matches on a national scale. Visit Hearthstone’s official site or check in at your favourite bookmaker for more information on upcoming tournaments, leagues and matches. In this article, we’ve presented our top five betting sites for Hearthstone game betting, outlined the reasons why we’ve chosen them, and explained what we look for when reviewing an e-betting site. We’ve given some useful advice for Hearthstone betting, provided an overview on Hearthstone gameplay, as well as having run through the game’s exciting tournaments. So, if you’re tired of seeing the same few esports on your bookmaking site’s portfolio, perhaps it’s time to add an eclectic new game into the mix, and start betting today!